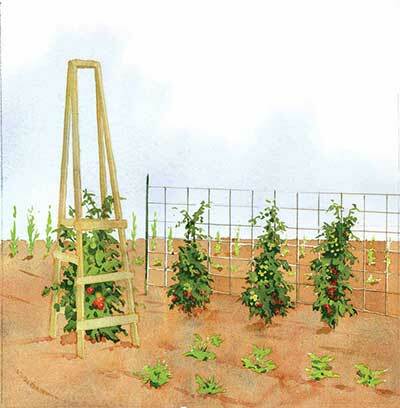 While some people grow determinate tomatoes so that they don’t have to worry about a trellis, anyone who wants to grow an indeterminate variety is going to need one. Whether short or tall, big or small, I’ve got a list of different options which will help ensure your tomatoes have the support that they need to give you huge quantities of fresh produce! I’ve broken these down into categories based on what is actually providing the support for the tomatoes, and included some rough estimates of cost and difficulty. 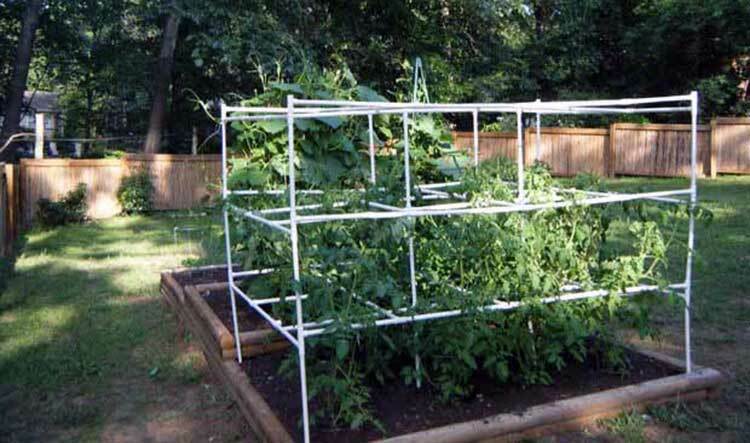 I’m really sure you’ll find a solution for your tomato trellis needs here! 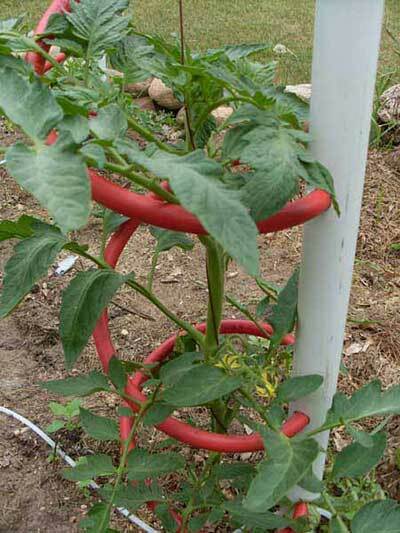 This is a really creative way to secure tomatoes! A framework made of T-posts and rebar securely mounted in the ground provides an anchor point. When the tomatoes are planted and quite young, a piece of twine is tied around the bottom of the plant and secured to the upper rebar. The plant is then trained around the twine as it grows. 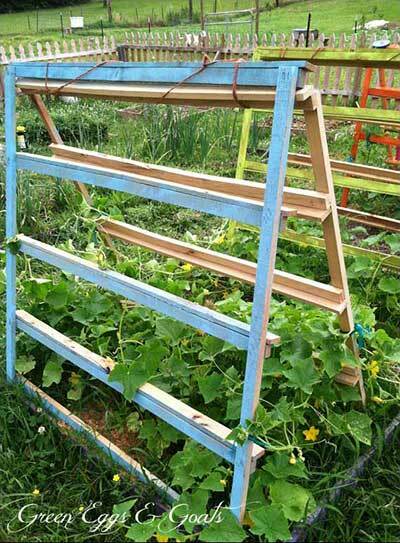 It’s an easy DIY build and, with the addition of a mesh screen panel, can be used to secure other climbing plants like beans and peas when you’re not growing tomatoes. Full directions and the process for training can be found at this website. 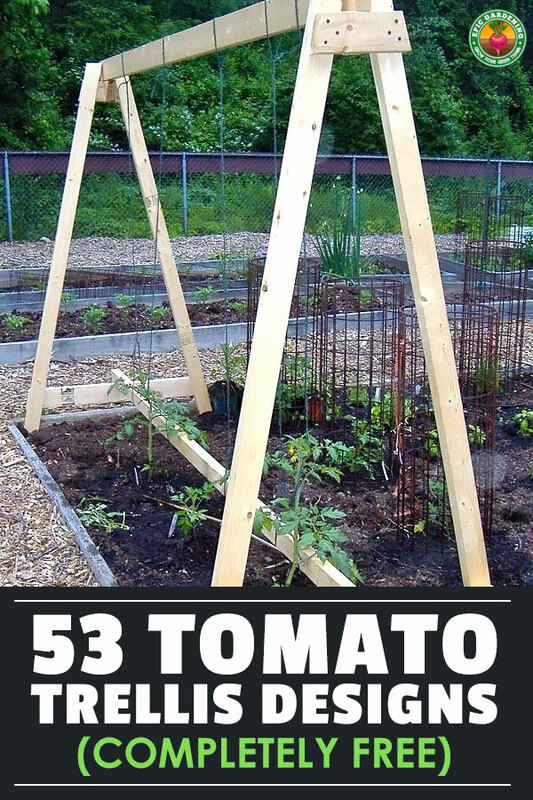 If you love the idea of twine-supported tomatoes, but tend to grow six-foot-tall tomato plants like I do, this lumber framework should help you out considerably. Since it’s so tall, you may also be able to drape shade cloth over it on hot days, or plastic on cold ones, thus adding protection for your plants and extending their growth cycle. Here’s how these people did it. 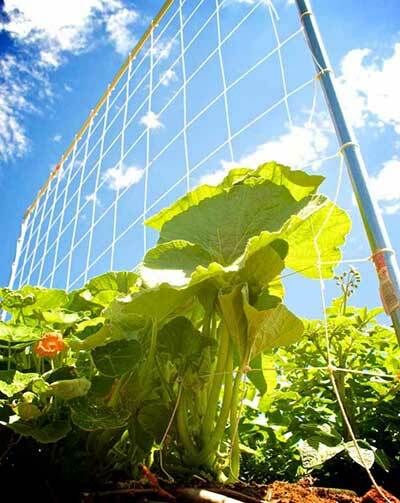 This trellis is constructed of rebar, electrical conduit, and nylon mesh. It certainly seems like it could be indestructible! 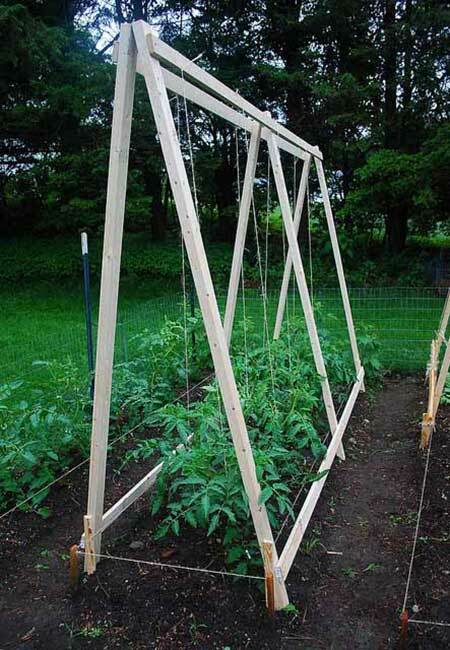 It makes a great row support for multiple tomato plants. Read how to do it on this site. I’m actually doing a Florida weave trellis this year for my tomatoes, and it’s working quite well! 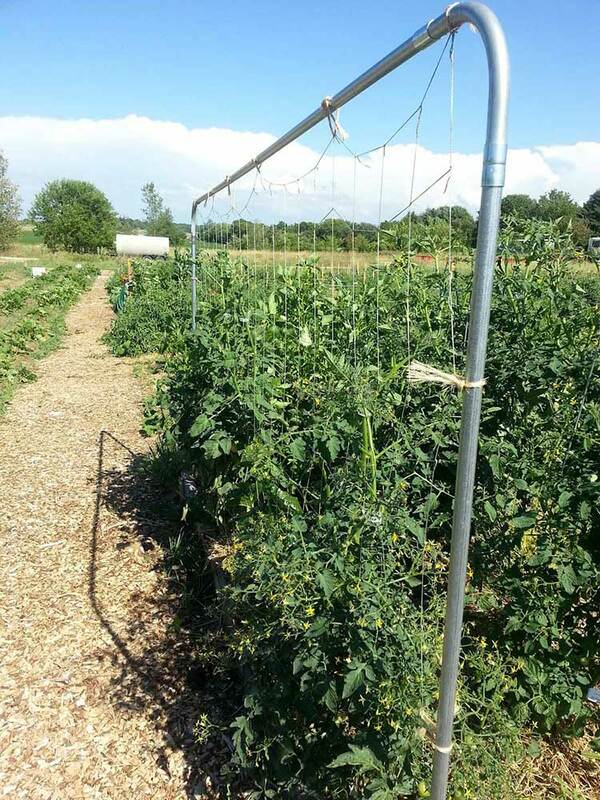 While it’s best used on determinate tomatoes to give them a little extra support, with tall enough stakes you can use it on indeterminates, too. The process involves securing heavy-duty stakes in the ground, then weaving twine or nylon cord between the stakes to create a cat’s cradle-like cage around the plants. This site teaches the process very well. This one’s a bit unusual, because instead of having the string support the tomato by holding it up from above, it supports the tomato as it grows diagonally up along the string to a frame. 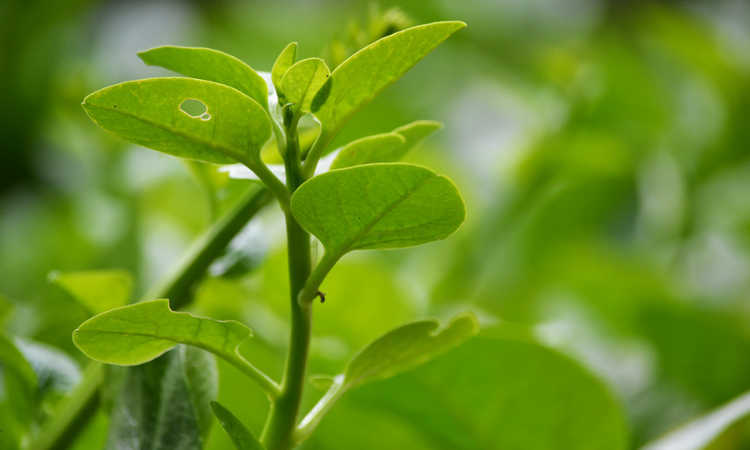 While it requires some training, it allows easy access to all sides of the plant, which is really useful. Check out the diagrams on this blog post. 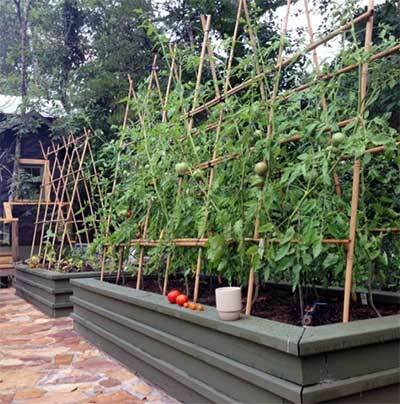 A slightly-angled wood frame helps to support tomatoes as they grow upward in this interesting design. Using tomato clips, the vines are trained up along the strings at a slight angle, providing ease of access to all sides of the plant. It’s almost a reverse of the one right above! Take a look at this interesting design. 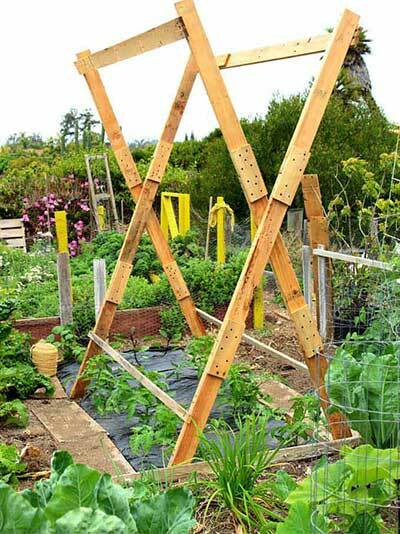 If you’ve got leftover string or twine and some old branches or scraps of lumber, you can build this trellis. It’s not elegant, but it’s definitely functional and serves its purpose well. Take a look at suggested components and how to put it together. 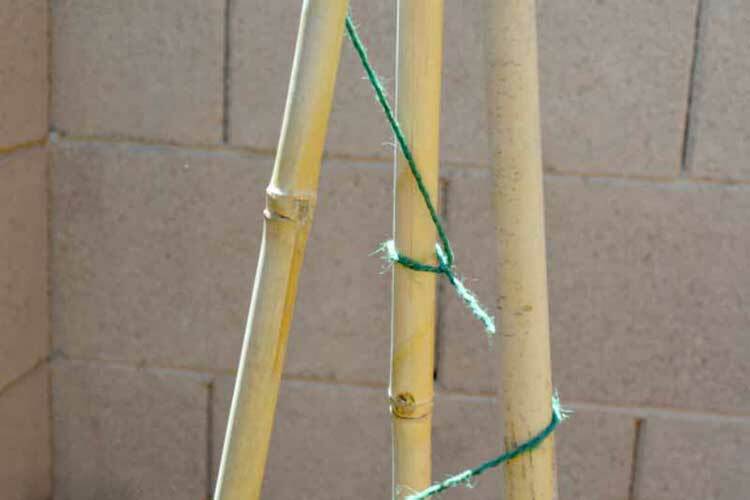 While not as fancy as the commercial metal tomato spirals, this tripod of bamboo anchors twine in place to provide the same sort of support. It’s a simple and quick construction that works surprisingly well, although the twine doesn’t last for more than a season. You can read the instructions here. 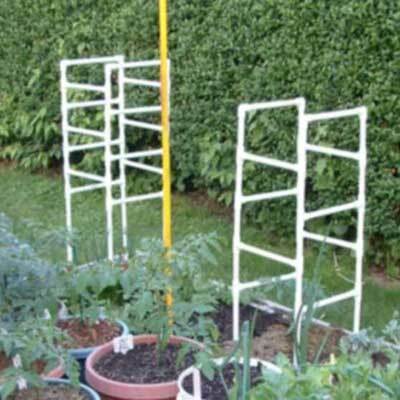 Whether you’re growing tomatoes or any other climber, anything that fits into a relatively-small footprint is a breeze with this setup. 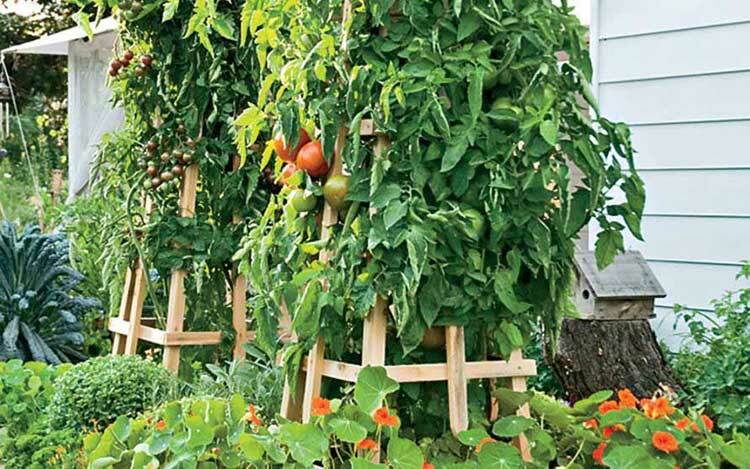 Two narrow raised beds are paired up with an arching trellis to which you can secure tomatoes, allow pole beans and peas to climb, or even encourage an archway of grapevines. And best of all, it’s harvestable from all angles this way! Detailed plans can be located here. This guy has an unusual design – a lean-to constructed of livestock fencing and fenceposts. 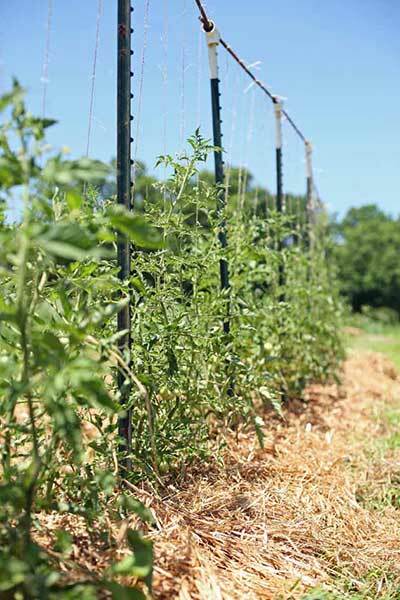 When your tomato is planted underneath the sloped surface, it will grow up through the fencing and get the support it needs. At the end of the season you just pull out the fencing and posts and stack them out of the way! How to set it up is available here. There’s a whole lot of pictures in this blog post, so let me recommend that you scroll down the page. Eventually, you will come upon a rather ingenious system – a pair of mesh panels supported by wooden corner posts. 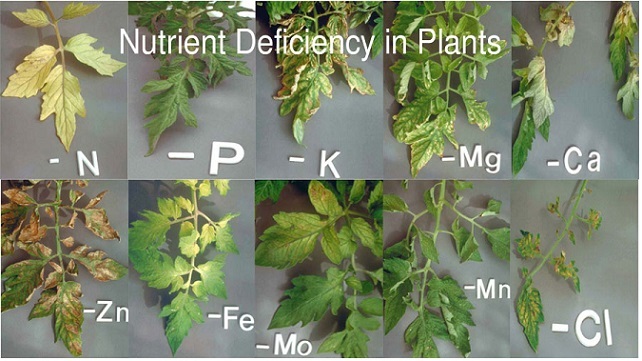 Tomatoes can grow up through them and get the support that they need, and they can sprawl a bit, too. Photos are at this blog. 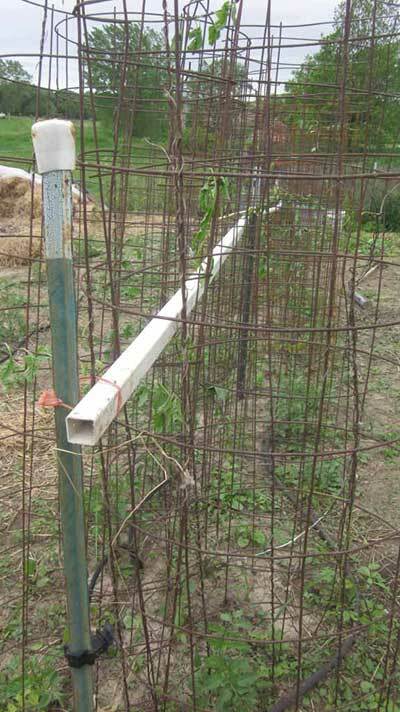 While I mentioned other options using wire mesh earlier, if you have old livestock fencing lying around the yard, why not put it to work as a long trellis to tie your plants to? It’s handy stuff. Take a look at the website for this type of trellis plus a couple we’ve already mentioned. 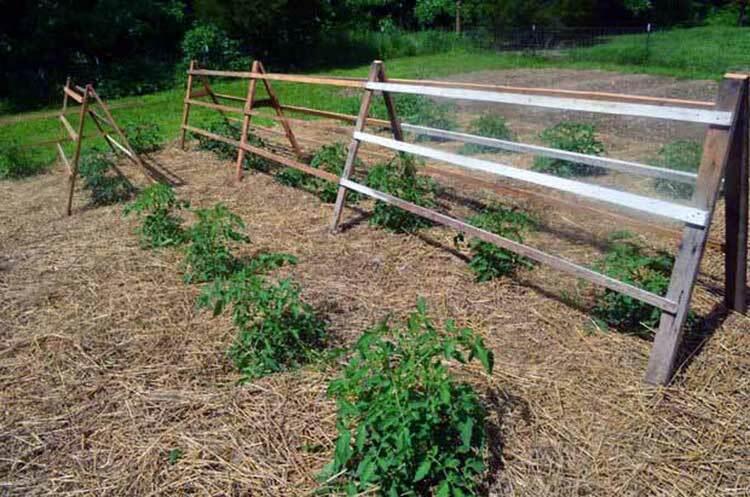 With a bit of work, you can turn that livestock fencing into individual tomato cages, too. 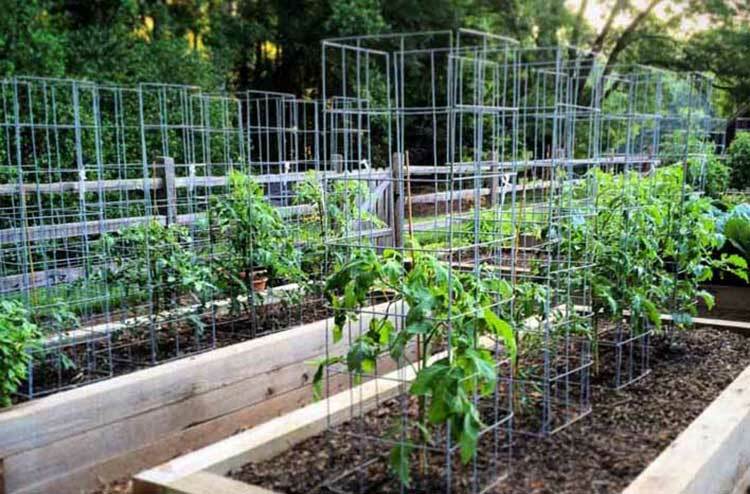 This design creates V-shaped panels, and you can place two panels together to form a full cage, or leave them as V’s and tie the tomatoes to them. They stack in a neat stack at the end of the season. Visit the site for more on how to build this. This has long been one of my favorite styles of tomato cage. Using concrete reinforcing mesh, you build a cylinder that can support an immense amount of weight in tomatoes. One roll of concrete mesh can make a bunch of cages, so it’s relatively inexpensive if you need a lot. However, you will definitely want some solid wide-jawed pliers and heavy gloves to build these. I have used them without staking in the past and the weight of the tomato plants held them in place, but you can add a piece of rebar to stake them as well. Check out how to build them! 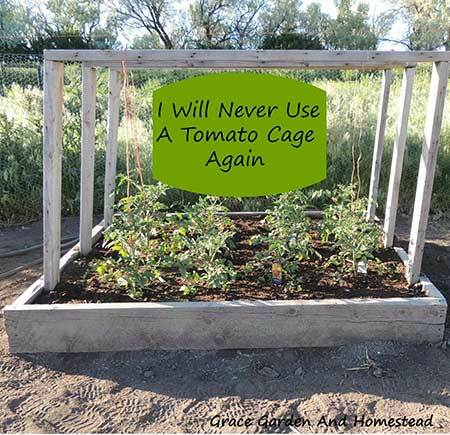 Do you have tons of tomatoes and are dreading making cages for them all? Take a look at these simple plans for an option that will help you out. The Stake-A-Cage features a heavy mesh attached to a long wooden stake. It creates a very functional option at an attractively low cost. If you grow in containers, you know how many problems there are in effectively staking your plants. 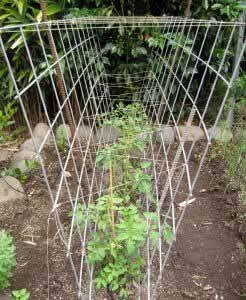 Commercial tomato cages that fit into large containers tend to be weak and collapse under the weight of your plant. 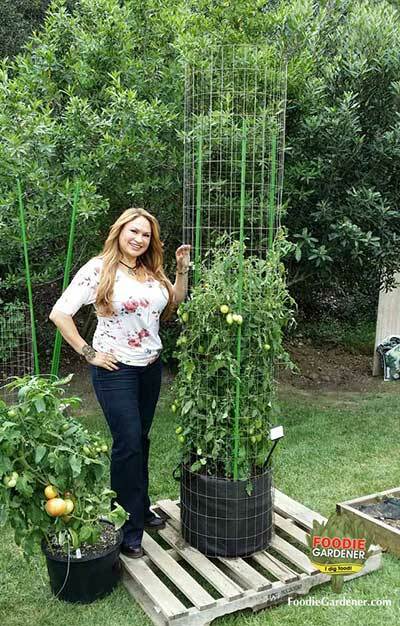 This expandable tomato tower can reach up to ten feet tall and will maintain its structural integrity throughout. You can read how to do it here. It’s really as simple as the name suggests. 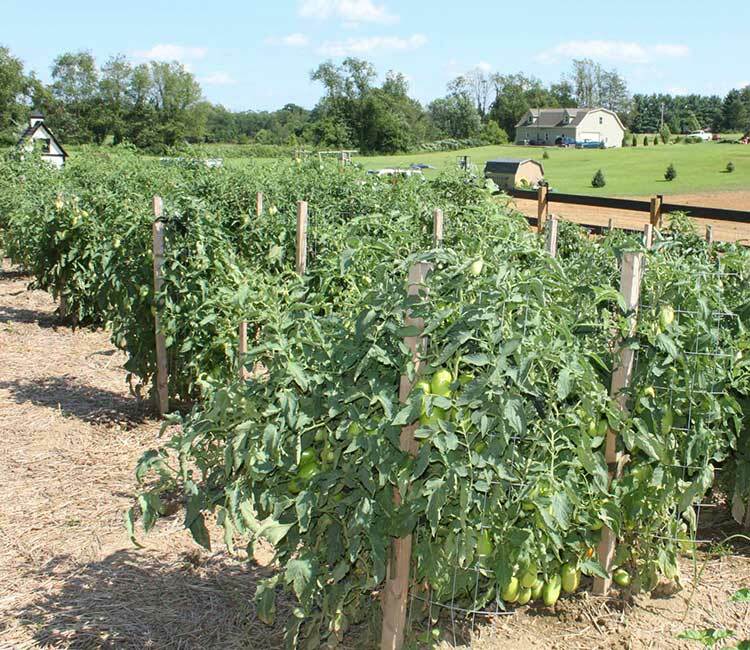 This arched style of trellis is primarily formed with cattle panels, and string or twine helps encourage the plants to grow up and around and through the panel. 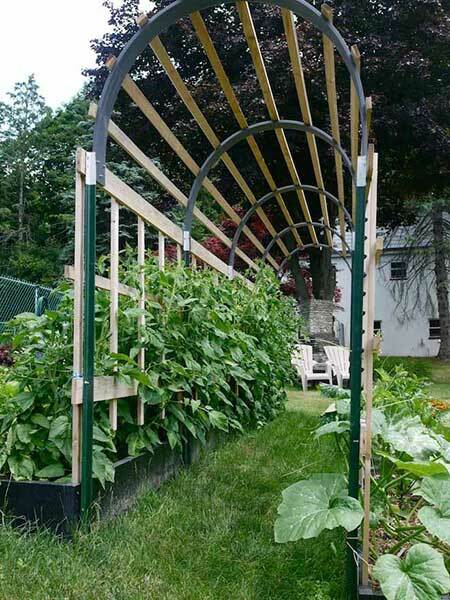 It is not as fancy as some other arched trellises, but it certainly does what it’s meant to do! See how it’s assembled for more information. A bit stronger than a concrete reinforcing mesh, this bent cattle panel will withstand pretty much any weight that’s put on it! It takes a couple people to assemble it due to the difficulty of bending the panel, but it will last for years and years. Check out the build process in this post. This is actually a pair of trellises constructed of hog wire, and placed closely together to ensure that plants are supported well on all sides. It provides great support for a minimal cost. The photos and instructions are clear and concise. While this one is similarly-constructed to a few of the other cages we’ve discussed, the way it’s used is not. 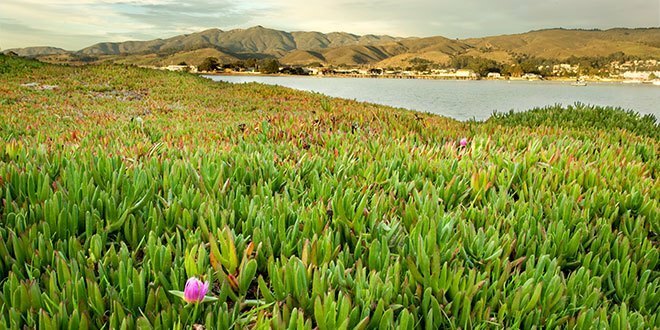 After constructing a ring out of mesh or fencing material, you plant four plants around the outside of the ring, rather than one plant inside of it. Add compost to the interior of the ring to feed the plants, and secure the plants as they grow. This is a great way to maximize your planting in a small space! Here’s how to do it. 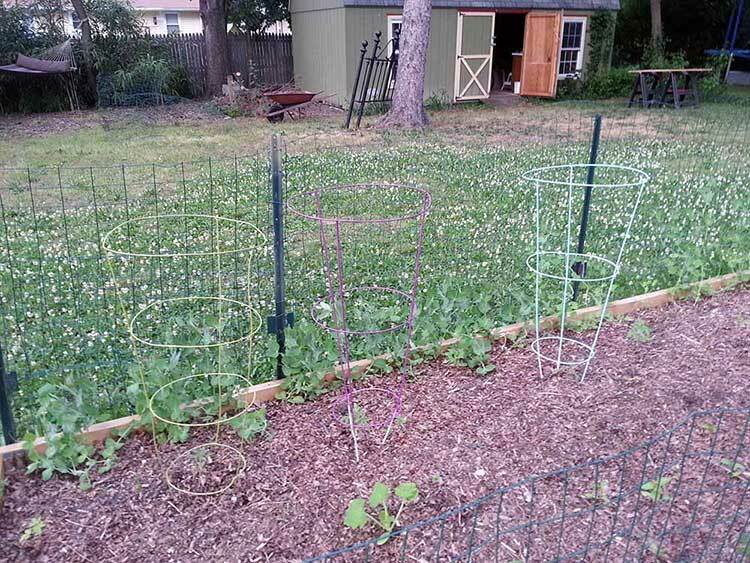 If you have leftover PVC pipe lying around, pick up some connectors and pull out your PVC cutter, because this tomato cage is super-easy to construct and can be taken apart for storage after the season ends. This particular version has a heavier long piece of PVC pipe used as a stake to connect the cage to so it doesn’t move around. It’s easy, efficient, and sturdy. Check out the concept here. This PVC cage doesn’t need connectors — but you will need a drill and some patience. Wide-gauge PVC is used to create the corner supports, and conduit is run through holes in the PVC to provide crossbar support. It’s actually really inexpensive, provided that you’ve got the required size of drill bits already, and it’s very sturdy. Check out the build process! Do you have a lot of tomatoes in a small space? This blocky structure will help! 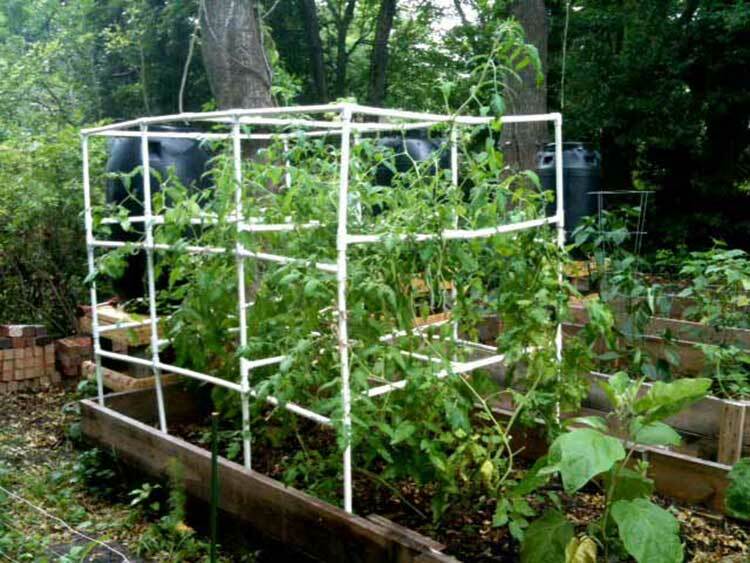 Using a network of interlinked PVC, this style of cage helps support a multitude of plants no matter the weight, and can be disassembled later to store (provided, of course, that you don’t use PVC glue to lock it all together). It’s a simple yet effective build, and you can see it right here. PVC is lightweight and easy to work with, but super-sturdy, which makes it ideal for this container-garden cage. Designed to work with the rectangular self-watering types of containers, it can also be modified in design to work in a standard garden. Look at the diagram here. Another container style, this forum discusses how to assemble and work with a PVC framework cage for an Earthbox. This one is unique in that it only uses one specific (and relatively inexpensive) shape of PVC connector, and the side bars are at different heights. Effective, and easy to snap apart and store during the winter! Take a look. This large boxy style is perfect for raised-bed gardens. 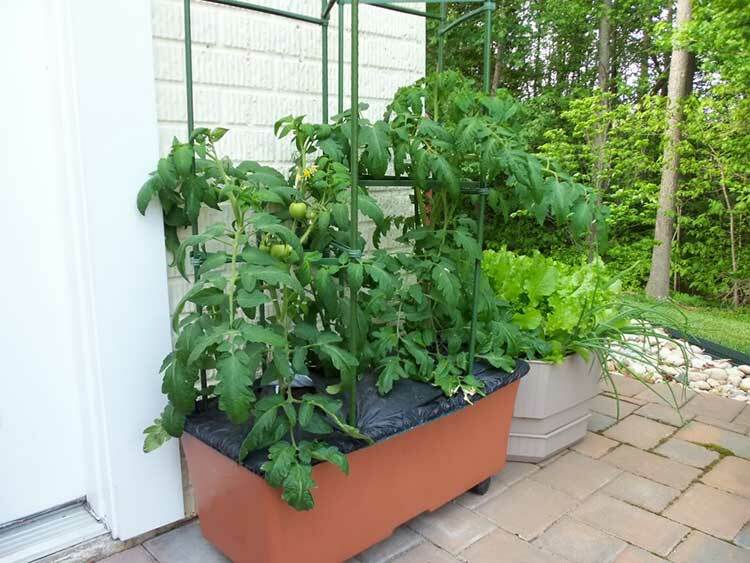 With some added support from twine, it can handle multiple plants with ease, and can be taken apart for easy storage like most of the PVC designs. Here’s how they built it. Another offset design, this one is meant for use directly in gardens rather than for container gardens. Like the one for the Earthbox, it only uses a single style of connector, meaning that you can purchase your connector type in bulk and get them cheaper. Here’s an image of how it’s built – it’s easy to determine your own sizing. This style of PVC cage offers the most support of all of the PVC options, but it can be difficult to find the 5-way connectors that are used in the central part of the cage. Three different kinds of connectors are used on this setup, but it provides maximum support and ease of use – and a few pieces of rebar used as ground stakes adds even more stability. It’s worth hunting down those connectors for! Read more here. 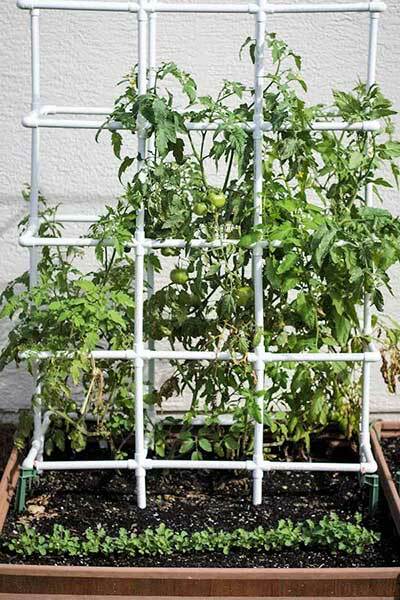 This crazy hybrid of a tomato spiral and a PVC cage is strange to look at, but quite effective. It is almost a type of garden art, but a functional variety of art at that! It can even be rigged to act as a liquid-nutrient delivery system at the same time. Read more about this unusual contraption and how it was constructed. 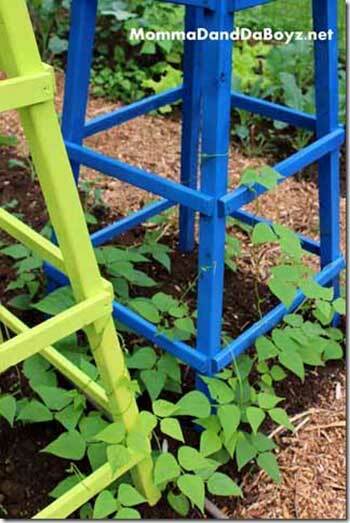 Want something sturdy that will hold up to the weight of most heavy-producing tomato plants? Look no further. 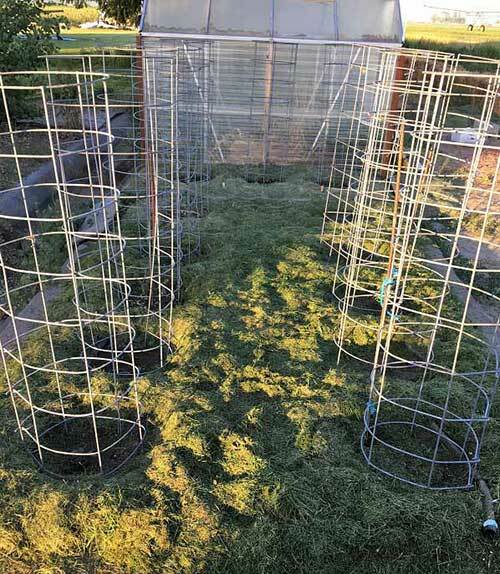 This simple, yet effective, tomato cage can be built to any height or spacing requirements and takes mere minutes to assemble once you’ve finished cutting the wood to length. It looks great in the garden, too. Complete directions for the build are available. 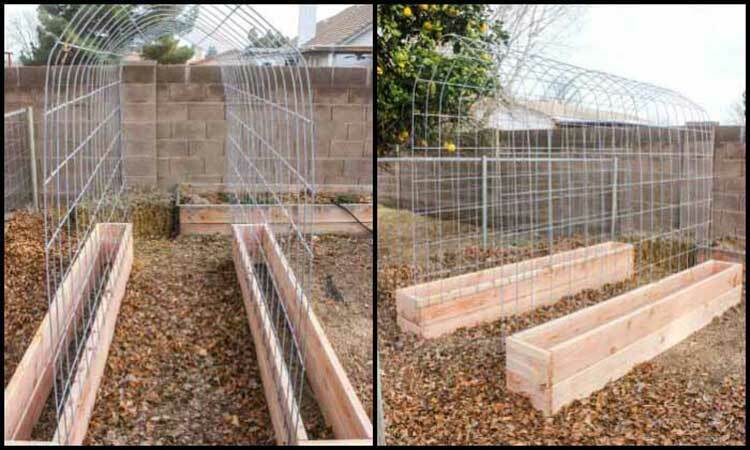 No instructions are included with this image, but the concept is very simple: set four wooden posts into the ground and screw on premade slat trellises. 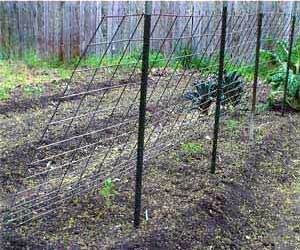 This forms a secure grid for your plants to grow through that will help support the eventual fruit. And it looks great, too! A lot of people like the angled shape of an obelisk-styled tomato cage, and this one will last for a long time to come. Constructed of wood, it offers ample support to the plant’s branches while still maintaining a nice sense of style. There’s full instructions with wood measurements! 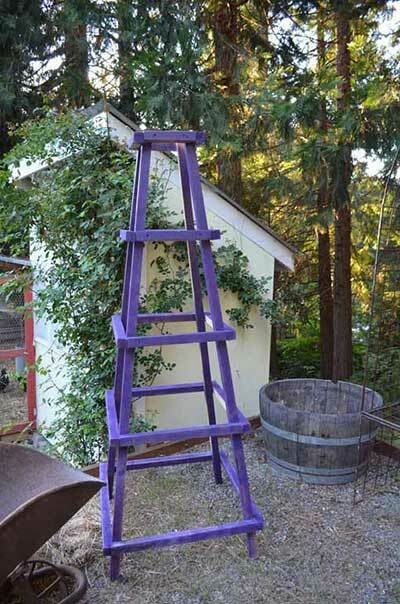 This is a great option for people who’re doing raised beds. 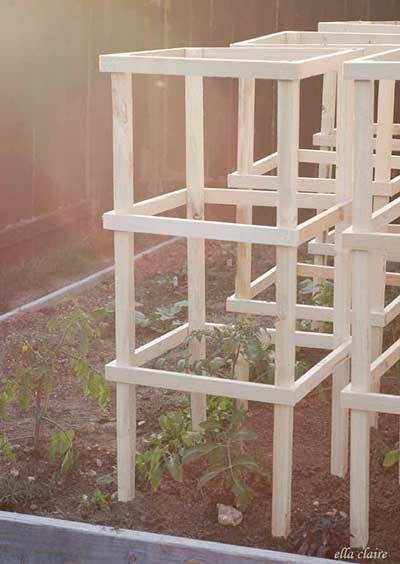 Using scrap lumber, you build a frame over your tomato-growing area. Once your plants are in the ground, tie a piece of twine to the plant, and tie it to the framework loosely. As the plant grows upward, you can shorten the twine, thus securing the plant to the frame and helping it stay upright. There’s a bunch of images here that can assist you in your build. 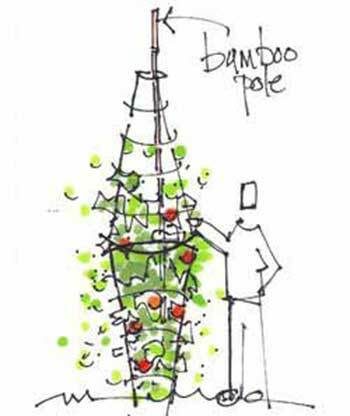 This is a great use for bamboo, whether wild-grown or extra cuttings from your own bamboo stand! Bamboo holds up to the weight of tomatoes really well as it’s a durable wood. I might personally secure the bamboo cages together with a screw through a drilled hole, but the designer used inexpensive materials around the house to put these together just as easily. Check out the concept at this site. What a cunning concept! We all know how a ladder opens up for use. Well, this works very similarly, and you use a screw to secure it in place while your plants are growing. At the end of the season, remove the screws on one side of the side bars, fold it up, and store it just like you would a ladder. You can see how it’s done right here. 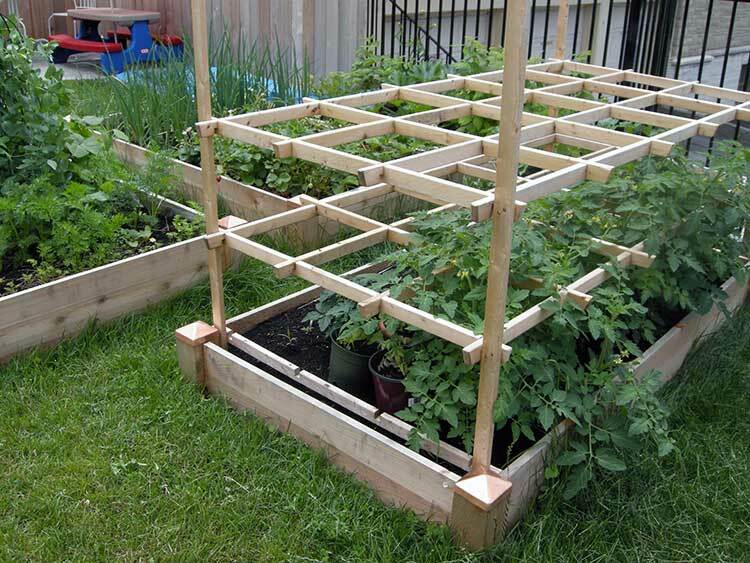 If you’ve redone your deck recently and have any scrap wood, you might be able to construct this tomato cage. Because it’s pressure-treated, it’ll hold up to moisture like a champ, and its sturdy construction ensures your tomatoes will have no problems whatsoever. Take a look and see how it’s made! 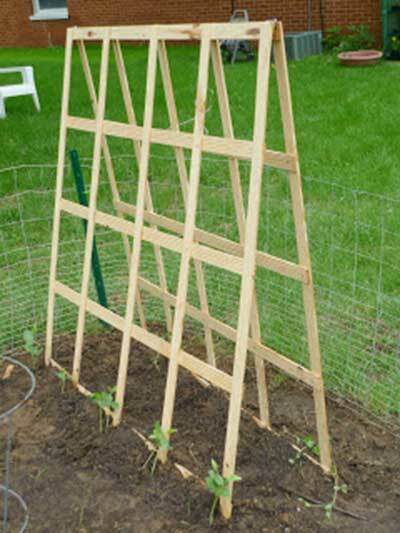 All you need for this triangular trellis is a bundle of wooden slats, available at pretty much any home and garden center. 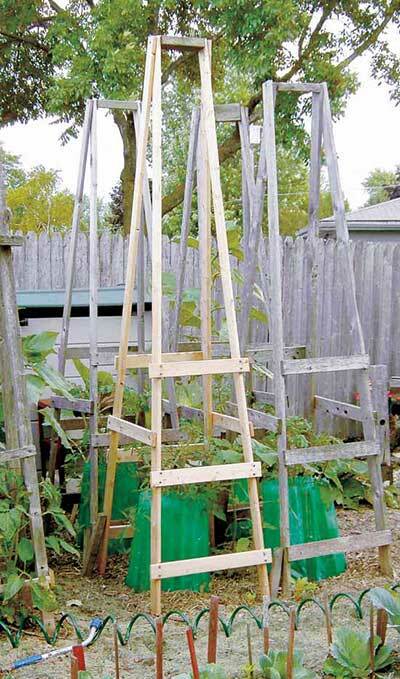 Making an A-frame that’s joined at the top with hinges, you’ve got a trellis that can be virtually any height, and the use of a stake or two will keep it from sliding out of place until the tomatoes can weigh it down. It folds up into a flat profile that can be tucked easily into a shed or garage. Check out the full directions! Obelisks are really popular because they look good in the garden, especially with a nice coat of paint. This version is particularly appealing, especially if you add a topper like a pinwheel to help keep birds at bay. Here’s a full how-to on these inexpensive homemade obelisk cages. Got some old scrap lumber and sturdy twine? 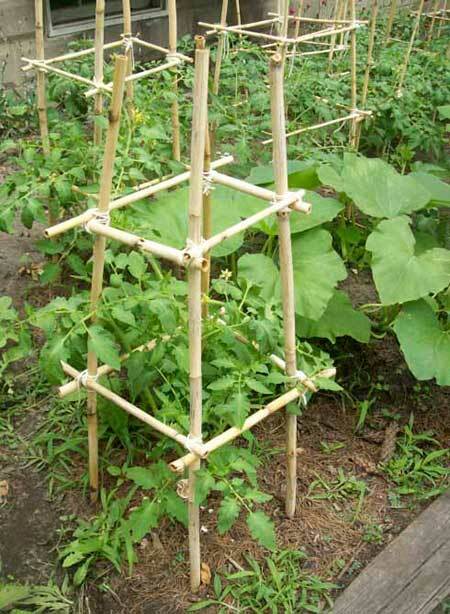 Then you have everything you need to build this trellis. It’s supported by driving the bottom posts into the ground at an angle so that they’re crossed at the top, and then lashed-on crossbeams help support an entire row of plants. Easy to construct, easy to use, and at the end of the season just cut the twine and it all falls apart. This is a stunning trellis concept for people with a bit of available space. 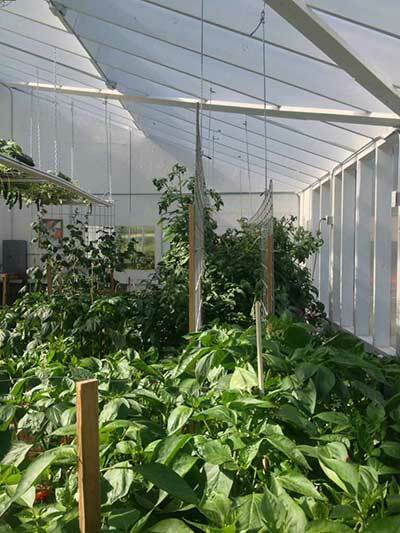 Because the tomato plants are secured to an arch, they can just keep growing up and over, and you can harvest easily from both sides of the plant, plus it provides a nicely-shaded area to take a break from the sun. 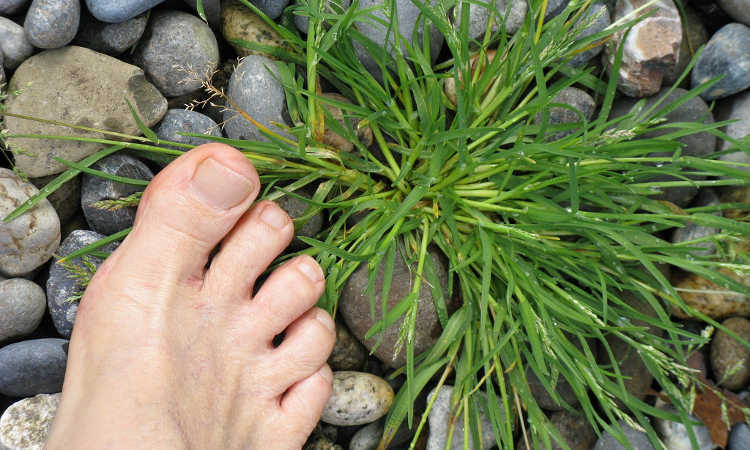 It looks great in the garden and is definitely worth consideration! Here’s how it all goes together. 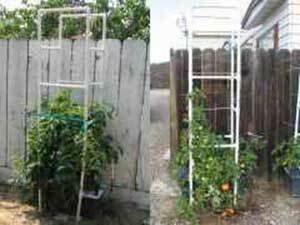 Made similarly to an obelisk, this tomato tower provides heavy-duty support in a small footprint. And it looks great, too! They recommend using cedar, but you could likely use douglas fir or pine as long as you gave it a coat of weather-resistant paint or stain. Full instructions and a cutting list are available on this website. 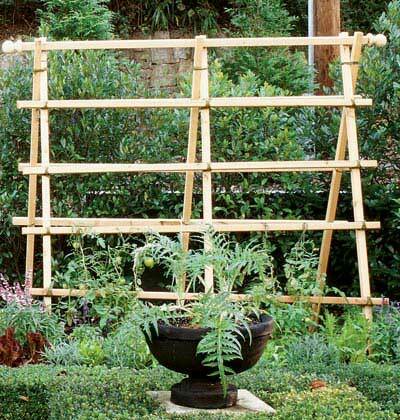 This trellis is made out of split bamboo, secured together with nails or screws, and is designed to work well in a raised bed or tall container setting. It’s a simple build overall, which is good as it’s not described thoroughly. You can see a photo at this link. 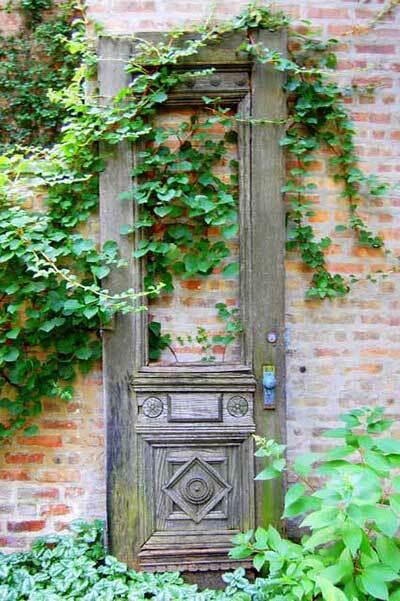 If you’re a fan of all things vintage, why not bring them into your garden as well? This blog post shows how to turn old cribs, frames from broken mirrors, bicycle wheels, chair frames, and more into features in your garden while adding support for your plants. 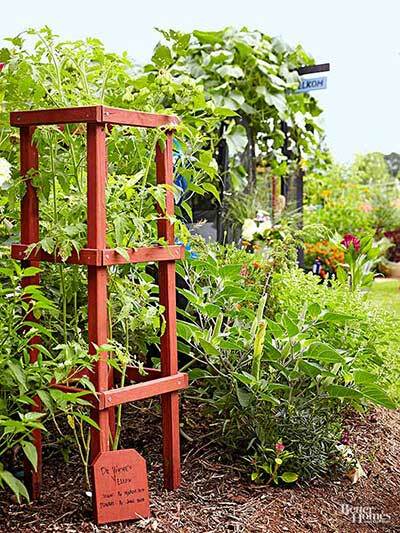 While not all of them will work for all types of tomatoes (a heavy beefsteak tomato is likely going to need more support than a coat rack will provide), they add charm and interest to your garden space. If you have an abundance of old shipping pallets lying around, or know a place to get free pallets, this is one of the cheapest tomato cage options on this list. 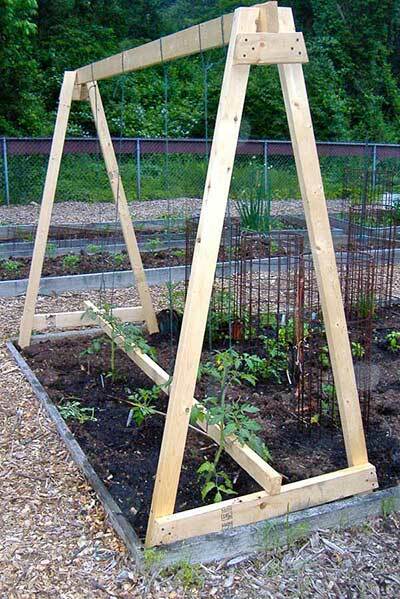 This A-frame trellis offers quite a lot of support for a row of tomatoes. Read more about this pallet process! Much like the other recycled pallet trellis, this one uses recycled pallets — but in this case, the pallet frames form much of the framework. It’s a little easier to do than disassembling and reassembling pallet wood. Painted in bright colors, they look great in the garden. Check them out! 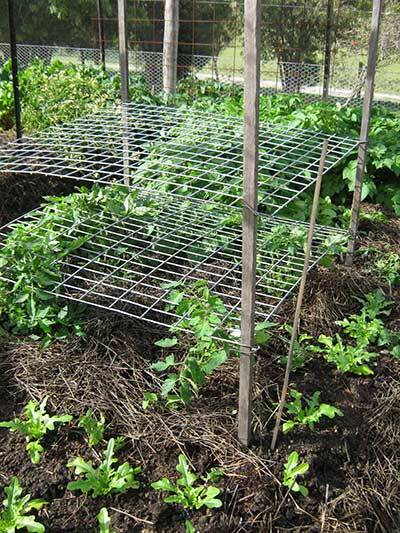 Are your old tomato cages getting a bit rusty? Take a little steel wool to them to clean off the rust, straighten out the wire, and add a coat of outdoor paint, and suddenly you’ve got colorful cages like the expensive ones at the garden center to secure your plants. Here’s how to do it! This interesting frame, shaped like a pair of X’s with crossbeams, is constructed almost exclusively out of old pallet wood. 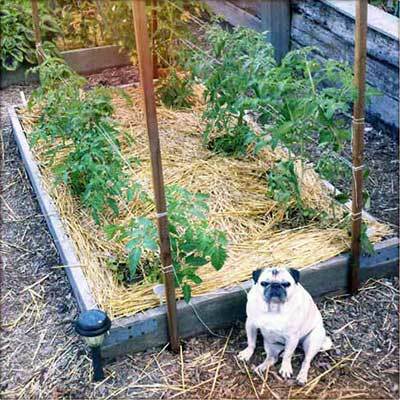 Heavy-duty garden twine acts as the support structure, while the heavy wooden framework keeps it all upright. It’s a neat project and quite a centerpiece in the garden. Take a look! In this newspaper article, there’s a number of cages discussed, but the one I’ve zeroed in on is the tomato cage stack proposed by a landscape architect. If you have some of the old conical cages floating around and are interested in experimenting with them, you can join two of them together to make a strange-looking, but much taller cage. You need to add a little extra reinforcement, but it’s surprisingly effective. Click through for more information! 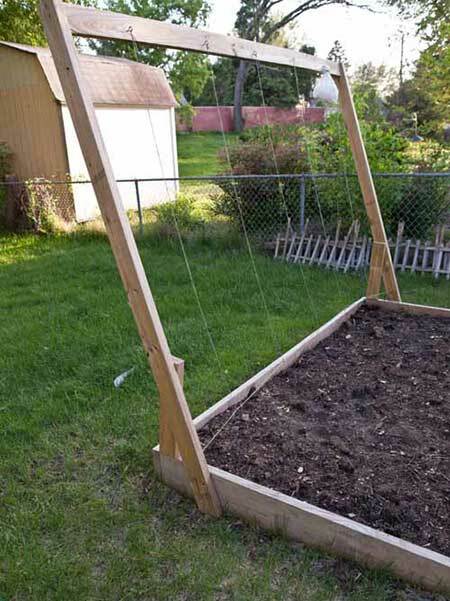 Why use a trellis when you can have gravity help you? 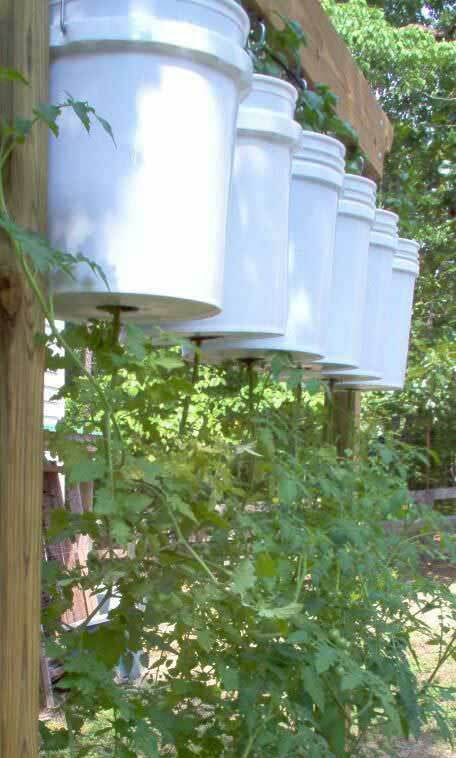 After the “Topsy-Turvy” tomato planter fad from a few years back made it popular to grow tomatoes upside-down, someone came up with a way to DIY it a whole lot cheaper. Here’s how! This design combines the features of an upper support with lower staking to offer as much security in a windy environment as is possible without using a cage structure. It’s an interesting technique, and one which would work equally well in a non-windy environment. Check out the video of the process! Fencing is a popular component, as you can see. In this variation, heavy-duty bull fencing is paired with a zig-zag of twine to add extra support between the two panels. This is by and large one of the most effective fence panel setups I’ve seen, and is definitely worth reading more about. 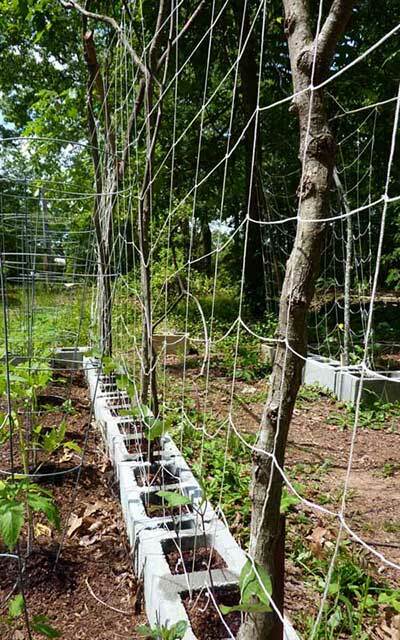 Here’s three different variations of tomato supports — a wire mesh fence that you tie your plants off to (good for cherry tomatoes), a shorter twine-based support, and a taller twine-based support. All three are effective, but I particularly like the tallest option because it tops out at 7’. Even the biggest tomato plants don’t usually reach 7’ tall! Check out this blog post for photos and more information. This is a good overview of different tomato staking techniques. While most of them are covered in other forms in this list, there are a few that aren’t. There’s the use of EMT electrical conduit to help support concrete reinforcing mesh to make a long panel to stake to. Also, they cover the use of “Texas Giant” cages, as well as some commercial variations like metal spiral rods and more standardized cage options. It’s worth the reading through the article! 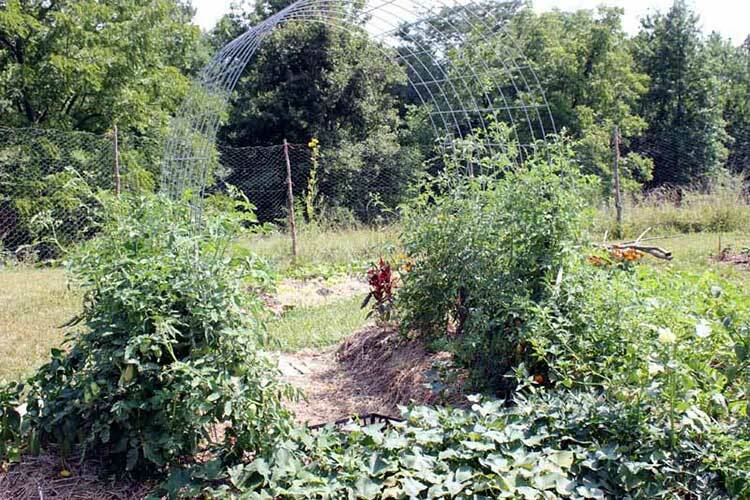 Hopefully, in this exhaustive list you’ve found the perfect solution to tie up your tomatoes and keep them safe from pests and disease. There’s truly a solution here for everyone! I’ve tried quite a few of these techniques and I have to say I haven’t been disappointed yet. What’s your favorite method of securing your tomatoes? Let me know! 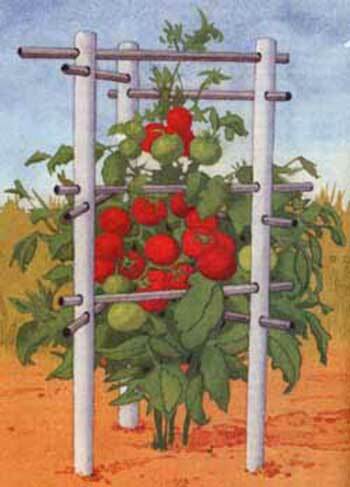 I never knew there were so many designs for tomato cages. One area we have been concentrating on is making sure however you trellis your tomatoes, that you are using materials that won’t leach into your soil or plants. 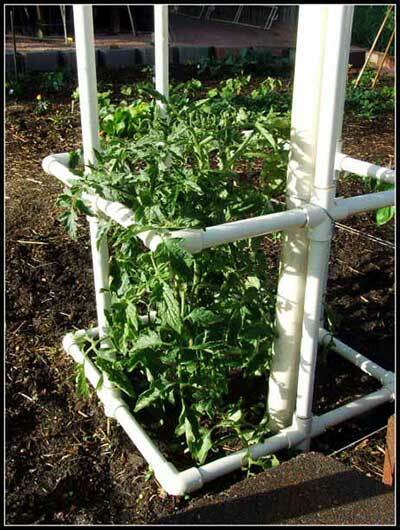 We have a food safe trellis made from recycled plastic. It has UV inhibitors and is also considered medical grade. If you decide to post this, please note this is a patent pending product from Scroll Trellis and is made in the USA in Wisconsin. Thank you. (With sales of these we want to help people in South Africa grow food). Who’d have thunk, right? I love all of the creative ingenuity in these designs. 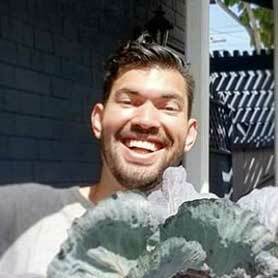 If you could send me a photo and a description as well as the data in my table in this piece to kevin@epicgardening.com I’d be happy to add it.